This Covenant faction was one of the several splinter groups of the former Covenant who continued to worship the Forerunners and oppose the UNSC after the end of the Human-Covenant War. The group was led by Zealot Merg Vol. "The fighting started when a splinter sect of Covenant ignored the Ceasefire of 2552 and attacked UNSC forces. By the time the fighting was done... Well, it didn't end well for the UNSC and Covenant, either one." In 2554, the faction attacked the planet, and X50, and clashed with the UNSC for the Forerunner relics present there, lead by Zealot Merg Vol. Two SPARTAN-IVs, Sarah Palmer and Edward Davis, participated in the campaign. The UNSC was successful in alerting the planet of the Covenant's attack and evacuation began. Early in the battle, the faction quickly took control of the moon. Later in the battle, Merg Vol discovered the true purpose of Draetheus V's moon. It was a Forerunner device that was used to build or destroy planets. The Covenant forces activated the primary weapon of the X50 construct. Directed toward the planet, the beam began to disintegrate Draetheus V, destabilizing it. Enormous slabs of rock were slowly floating away from the planet's surface and both UNSC and Covenant troops were scrambling to get to safety as the UNSC continued to evacuate the planet. The Covenant continued to attack the planet and the UNSC quickly realized that Draetheus V was ill-prepared for a full evacuation. There was not enough transportation to allow everyone to leave Draetheus V. However, the UNSC raided a Covenant airfield and stole numerous Covenant aircraft. With the help of Spartan Sarah Palmer, 23 Covenant aircraft carrying civilians made it off the planet. While defending the moon, Spartan Edward Davis was killed by overwhelming Sangheili forces. Spartan Palmer arrived at X50 and eventually killed Merg Vol in the control center and sabotaged the device, stopping the dismantling process of the planet. Shortly after the battle, the UNSC discovered a looping transmission of low-frequency static from X50. Palmer and UNSC forces returned to the moon to investigate. However, the UNSC quickly realized that Covenant forces remained on the moon. After fighting through numerous Covenant soldiers, Palmer discovered that the message had originated from her Spartan compatriot Davis, moments before his death. She shut the device down in order to allow her friend to pass away peacefully. After the Battle of Draetheus V and the death of Merg Vol, his Covenant faction was dissolved. One of its surviving members, Parg Vol, joined the reformed Covenant led by Jul 'Mdama. Merg Vol's Covenant utilized much of the same equipment that the original Covenant used. Most Unggoy used the Type-25 plasma pistol while Kig-Yar troops made use of Type-33 Needlers. Sangheili personnel were typically armed with the Type-51 plasma repeater. Higher ranking members of the group used the Type-33 Needler and Type-52 focus rifle. Jiralhanae within the faction regularly used Type-25 Brute Shots and Type-2 gravity hammers. Type-32 Ghosts and Type-26 Wraiths made up the majority of the faction's ground vehicles with Type-52 Anti-Aircraft Wraiths serving as anti-aircraft artillery. The faction also made use of the Type-38 Tyrant and mega turret. Like the original Covenant the Type-26 Banshee remained as the main aircraft of the faction. Both Type-25 Spirits and Type-52 Phantoms were used as troop transports with at least one Phantom gunboat being used as Parg Vol's personal transport. 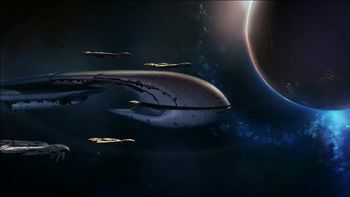 The faction's fleet was composed of at least four CAS-class assault carriers and five CCS-class battlecruisers. Most members of Merg Vol's Covenant (regardless of species) wore armor that saw common use during the Human-Covenant War. [note 2] However, Vol himself wore a variant of the Zealot combat harness common to Zealots from Hesduros, which is ubiquitous in Jul 'Mdama's Covenant. Spartan Edward Davis surrounded by Vol's forces. A Phantom escorted by Banshees over X50. Wraiths advancing on Research Facility Alpha. An Unggoy-operated Shade turret on Draetheus V.
A Sangheili and a mega turret on Draetheus V.
An anti-air Wraith defending the Covenant supply lines. Tyrant AA guns defending Merg Vol's base. Kig-Yar defend the entrance to the Cistern. ↑ Although a Hunter is depicted on Halo: Spartan Assault's cover art, none are encountered in gameplay. It is thus ambiguous whether Merg Vol's Covenant utilized Hunters. ↑ In a mission briefing screenshot revealed before Halo: Spartan Assault's release, a Grunt Major can be seen wearing his typical red harness. The Grunt Major was replaced by a Grunt Minor in the released game's same mission briefing, most likely because Grunt Majors in Spartan Assault don a silver harness similar to that of Grunt Ultras in previous games, instead of the red one.